I recently moved apartment in Zurich, and wanted to take a moment to plug the service offered by the removal company that I used, Kaylan Umzug. The provided a full service move; packing, furniture disassembly, hand-over cleaning with guarantee, rubbish diposal, and furniture re-assembly at the new apartment. And they were fast -- my 6 room apartment (approx 50m3 of material) was cleared in 4h30m (8a-12.30p), and it took the same amount of time to unload and reassemble at the new place (1p-5.30p). Despite having to get furniture up to the second floor in an elevator only large enough for four people. They provided a fixed price quote. Other companies that I spoke to quoted per hour. This always worries me, in that it gives them an incentive to proceed a little slower. There were no hidden charges in Kaylan's quote -- VAT and insurance were included. Other companies broke them out as separate items, or left them as small print (i.e., VAT was not included, the customer was encouraged to get their own insurance). Also, unlike other companies their quote included all the necessary packing material. Every other company quoted the move as taking two days. Kaylan did it in one (and were faster than their original time estimate. Finally, they were towards the cheaper end of the quotes that I received. The quote broke down in to three components. The move itself. CHF 4,560 (as already mentioned, inc. VAT, insurance, packing material, etc). The cleaning. CHF 1,500. This was marginally more expensive than the quote from my regular cleaning co., but I was happy to pay the extra to only deal with one company, as well as not have two companies getting in each other's way during the move. Rubbish disposal. CHF 600. I had approximately 8m3 of assorted junk that I no longer wanted and had failed to sell (or was too crappy to sell) that needed disposing. Overall, probably the least stressful move that I've ever done. The worst part was hanging around while they efficiently moved everything, feeling rather like a spare wheel. The last few days have been mostly travel, with a little bit of culture on the side. On Monday I allowed myself a bit of a late start, and spent some time meandering around Manuel Antonio making sure that I hadn't missed anything. My Interbus pickup arrived a few minutes before the scheduled 1.15pm, and after a brief stop to pick up another family going to San Jose we hit the road. The journey passed uneventfully, and I was checking back in to the Best Western Irazu a little bit before 5pm. Handily, this was right around Happy Hour at the local bar, which included a free drink. Scott from Package Costa Rica caught up with me, and we spent a bit of time over a drink talking what had and hadn't worked on the vacation, and he gave me the promised refund for the abseiling that wasn't. I'd cheerfully recommend them to anyone else who's considering a Costa Rica vacation and wants local experts to handle the itinerary. I retired back to the room, and discovered a small problem -- the walls were exceedingly thin. It seemed to be a double room (with connecting door) that had been converted in to two singles. To make up for it the WiFi was marginally less intermittent in this room than last time, so after catching up on a bit of e-mail it was time for bed. Tuesday was overcast, with rain threatening but never actually appearing. My flight was at 6, so I had some time free in San Jose. Reading through guide books had recommended the Pre-Columbian Gold Museum to me, so after a quick breakfast in the Denny's attached to the hotel (!) I jumped in a taxi and paid 5,000 colones to get there. It turns out that the same building also houses the National Coin Museum, so I started there. 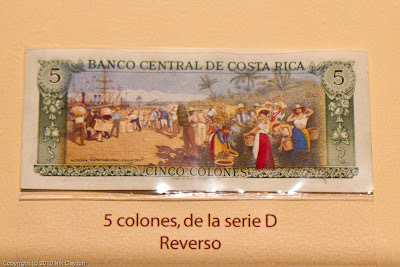 As well as (obviously) having a large number of samples of Costa Rican currency over the years the museum also has displays on the history of currency around the world, exhibitions that showcase the various categories of designs that have appeared on Costa Rican coins and notes over the years (animals, national symbols, plants), and background information about the types of scrip that coffee plantation owners used to use to pay their employees. I moved in to the gold musuem section, and quickly realised there was more to this than just gold. Arranged over three floors the museum covers the history of the people of the area, how they moved from a hunter-gatherer lifestyle to a more setteld agricultural one, and where gold first started to figure in to their culture. 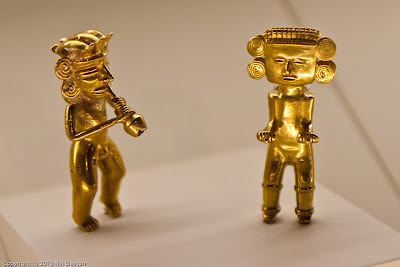 There are thousands of examples of gold work on display; human representations, animals, jewelry. Detailed displays also show how these were made using the lost-wax casting technique. It's not all gold though. As part of putting this in the wider context of cultural evolution there are videos and dioramas reproducing what's believed to be the lifestyles of the population at the time. And even a few artworks that aren't made of gold. Just when I thought I'd exhausted everything the museum had to offer I discovered a section set aside for an art exhibition, and ended up being captivated by a video display showing musical animations from musanim.com. Rather than describe it, just watch this video. I spent a very enjoyable couple of hours poking through the museum, and can heartily recommend it to other visitors to San Jose. With some time still spare I wandered out on to the streets of San Jose in search of lunch. I wasn't paying a huge amount of attention to exactly where I ended up, eventually choosing a restaurant based on the facts that first, it didn't seem to be part of a chain, and second, there was a healthy number of locals eating there. With that I jumped back in a cab to the hotel and then to the airport. To leave Costa Rica you have to pay a US $26 departure fee before checking in. This was straightforward to pay at the airport, but on trying to check in I bumped in to a problem. ESTA. More specifically, the fact that although I'd filled out the ESTA forms a couple of years ago I didn't have a copy of the form with me, or my reference number. I'd never needed it before. This seemed to cause the Costa Rican authorities some consternation that I might not be admitted in to the US. Eventually a combination of pointing out the numerous US entrance stamps in my passport (the most recent being less than four weeks old) and filling out a green visa waiver form placated them. The flight itself was uneventful, arriving at LAX 10 minutes or so ahead of schedule. I could have done without the one hour queues at immigration on arrival though. After queuing for the shuttle bus to La Quinta LAX I finally arrived at about 12.30am local time, and set about crashing out. The hotel was a perfectly serviceable place to stay. Mid-size room, decent breakfast, 10 minutes or so by bus to LAX, and not too much noise despite the proximity of the airport. Wednesday was another early start to fly to SFO, and then drive up to Tahoe for the last few days of vacation. Fog at SFO meant that we took off an hour later than planned (the only flight delay so far, not bad given there have been six so far on this trip). I picked up my car from Hertz, and headed out to Tahoe. This is a pretty boring drive, right up to the point where you enter Eldorado national forest about an hour out of Tahoe, at which point the view becomes much more scenic. It's a very different kind of beauty to the forests of Costa Rica (or the mountains of Switzerland for that matter), the range of plants and trees on offer is much reduced, and there's more bare earth to be seen than Costa Rica. Hangover, what hangover? Any lingering cobwebs from the night before were going to be shaken loose by a few hours on a jet ski. I've done this a couple of times before (San Diego and Denia) so knew what to expect, but I'd forgotten just how much fun this was. As with the previous day, I was collected from the hotel reception, and we embarked from the same marina as yesterday's sailing trip. Six jet skis set out, our guide on one, me on another, and a couple of families riding two-at-a-time on the others. We moved out perhaps a kilometre or so from the shoreline and opened up. These things are fast. They don't really become maneuverable until 20mph, and will cheerfully hit 40+ at full throttle. I spent quite a lot of time at full throttle. We followed a similar route to the catamaran sailing, at one point pulling past Tomcat on their tour. Even when the sea was calm 40 mph is pretty bumpy, and as waves started to build up the ride became more and more exhilarating. I discovered the best approach seemed to be lean forward as much as practical, and give and take with your arms, a technique not too dissimilar to being on a galloping horse. The jet skis ride very low in the water, so you get an excellent sense of the rise and fall of the ocean as you crest each wave, something that's not nearly so readily apparent when sailing. We passed the mooring point from the previous day, and pressed on for another 20 minutes or so, rounding in to a secluded bay. Pulling up almost to the beach we cut the engines, and dived in to the water to cool off and give our arms a rest from the incessant beating they took during the ride. No snorkeling though this time. Events took a turn for the entertaining when a passenger on one of the tandem jet skis got it in to their head to pitch over the side. No harm done though, nothing damaged except their pride. After far too short a time (but in reality about two and a half hours) we were back at the marina and mooring up before catching the bus back to the hotel. After a quick shower to wash the Pacific out of my hair I've spent the afternoon up in El Avion downloading and futzing with photographs. Tomorrow it's back to San Jose for one night, and then fly back to Los Angeles, before heading on to Tahoe for a few days. On Saturday morning I was up bright and early for an 8.20 pickup to go sailing and, with a bit of luck, catch sight of dolphins and whales. When the bus hadn't arrived by 8.30 I called the tour company, Planet Dolphin, and discovered that because of unplanned road works the pick up time was now 9.20. Ah well. I took the opportunity to explore a little more of the hotel grounds, and waited for the bus. After picking up a few people this deposited us about 20 minutes at Marina Pez Vela in Quepos, 15 minutes drive up the road. Our vessel was "Tomcat", a 60-something foot catamaran. Once all 42 people were onboard we motored out of the marina and towards our lunch time appointment, snorkeling in the Pacific. The crew explained the safety features of the boat in English and Spanish, and also covered the very important information that although beer was $1 a can, drinks with spirits were free. As a lifelong non-beer drinker I resolved to take advantage of this opportunity, and quickly had a very good rum punch in my hands. I've messed around on boats a bit, but this was my first time on board a catamaran, and I was surprised at how stable it was. I spent a lot of time stood on the bow (the pointy bit at the front) feeling the rock and fall of the boat under my feet. A few of the guests had decided to sunbathe on the netting slung between the two hulls toward the front. This turned out not to be the smartest move, as they discovered when the first wave crashed over them. Cue sudden gasps. There was a brief moment of excitement when we slowed to go past a very large sea turtle that was slowly swimming out to the deep ocean, and just visible below the water. But no other signs of large marine life. After about an hours motoring we stopped for 10 minutes and everyone had their first opportunity for a bit of a swim. 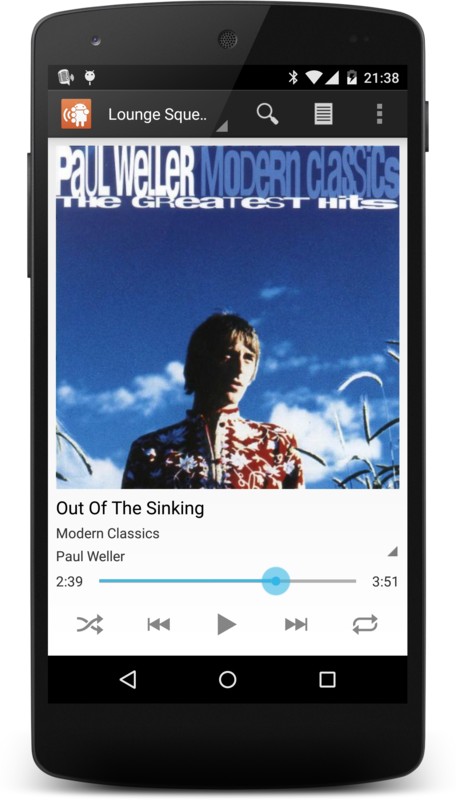 Just to get our feet wet, so to speak. Once everybody was back on board we continued on for what felt like 20 minutes or so to our final destination, a small not far from a small rock formation breaking through the waves. Duly adorned with fins, mask, and snorkel the crew suggested we swim close to the rock. It soon became apparent why. I was snorkeling along enjoying what was, to be honest, not much of a view underwater. Although the water was clear it was very deep, so tailed off to a green haze, with no clear idea how far away anything was. And then all of a sudden I was surrounded by fish. Sergeant Major fish to be precise, hundreds of them. The rock and the things that grow on it provide food for them, so they cluster around it. I was quite happy to float upright in the water, head under, watching these blue and gold fish dart this way and that, quite oblivious to the people that had invaded their environment. After about 20 minutes of this it was back to the boat for a simple lunch; fish kabobs and pasta. And then we set sail back to the marina. Literally this time, the wind having picked up enough that they could at least unfurl the jenny for a bit of sailing. The hoped for dolphins and whales continued to prove elusive, and there were no sightings on the journey back. The afternoon followed a familiar pattern. By which I mean it rained, heavily. After a few drinks in El Avion I resolved to wander down the coast road to find somewhere suitable for dinner. Outside the main entrance to the Costa Verde complex I bumped in to four people on a package vacation from California. After helping them take the requisite group photo we fell in together in search of food and drink. After stopping off at La Cantina, another of the Costa Verde hotel restaurants, we made our way slowly down to the beach. By this point the thunderstorm and rolled out to sea, and the frequent lightning flashes were lighting up the sky, silhouetting the islands that dot the bay against the grey of the night sky. Friday dawned fresh and clear. I needn't have bothered setting an alarm, the sun streaming through the thin curtains and the sounds of jungle wildlife a few feet from my door were enough to gently wake me. The bus down to the national park was prompt, and we got there after about 10 minutes driving. The tour itself took several hours, but we were only on the move for about 30 minutes. The rest of the time was spent in different spots with the guide explaining various bits of information about the flora and fauna that we were looking at. Equipped with a spotting scope he made sure that we all got the chance to see the various creatures in the park as close as was practical. The route through the park is very straightforward, consisting of wide gravel tracks, with towering trees on either side. The first animals we saw were three-toed sloths, getting ready to slow down for the day. The first one was quite distant, and after looking through the scope I was idly glancing this way and that while the other members of the group took their turn. Looking up I was a bit startled to see another sloth slowly moving along a branch not 20 feet away. We took turns peering at it through the scope, and it peered right back at us. We carried on along the path towards the beach, along the way seeing bats, spiders, Halloween crabs, raccoons, more sloths, and hearing howler monkeys off in the distance. The beach was to be our first encounter with white-faced Capuchin monkeys, who are very comfortable around humans. Unfortunately, people have shown themselves incapable of following the "Do not feed the animals" signs around the park, and this meant that the monkeys have learned to fish trash out of the bins for any scraps that have been thrown away, and to distract owners from their backpacks before making off with them and unzipping the various compartments looking for food. The beaches themselves were straight out of a brochure; golden sand, blue skies, palm trees, little islands off in the bay, and we spent a bit of time on the beach (with bags safely secured) before continuing the last quarter of the tour. Up in the trees was another sloth, but this time of the two-toed variety. The guide's description of him as "Costa Rica's Chewbacca" was very apt. Our guide proved to have sharp eyes; as we were walking carefully along a path by the lagoon he spotted a caiman lurking in the undergrowth. Members of the crocodile family, they're distinguished from crocodiles by the shape of the snout and position of the eyes. They also tend to be a fair bit smaller than crocs. Not 30 feet further down the path we discovered two small boas curled up in the branches of trees overhanging the path. Because it was high tide the tour finished with a 30 second boat ride across a small lagoon, before heading back to the tour bus for very welcome fruit and water. I spent the rest of the day enjoying a lengthy siesta, the heat having brought on a bit of a headache. I felt it best to self-medicate with a couple of drinks by the verandah and let the day go by. On Thursday I traveled from La Fortuna to the Hotel Costa Verde in Manuel Antonio. There's not much to report about this; the bus journey took five hours or so, arriving at the hotel at about 1.30. There's no free WiFi at the hotel (really, in this day and age), and as general rule I never trust my passwords to public internet terminals (and refuse to pay on principle), so these next few posts have been written offline over a few days. The hotel itself is spread out over a number of different locations. My room is one of two overlooking the ocean beneath the El Avian restaurant. This restaurant's claim to fame is that there is a reconstructed C-123 cargo plane in the bar. Actually, it's a bar in its own right. Our Fairchild C-123 was a part of one of the biggest scandals in the mid 1980s. During this time the Reagan administration had set up a bizarre network of arms sales to Iran designed to win release of US hostages being held in Lebanon and raise money to find the Nicaraguan, counter-revolutionary guerilla fighters, commonly referred to as the "Contras". With the CIA's help, they purchased several items, including two C-123 cargo planes (one of which is our plane), two C-7 planes, a Maule aircraft, spare parts, and munitions. They also built a secret airstrip on an American-owned 30,000 acre ranch in northwest Costa Rica. On October 5th 1986 a US cargo plane (the twin sister of El Avion's own Fairchild C-123) was shot down over southern Nicaragua. As a result of this successful Sandanista strike on our Fairchild's sister plane the cargo operation was suspended and one of the C-123s was abandoned at the International Airport in San Jose. In August 2000 we purchased the abandoned Fairchild for $3,000. We then disassembled and shipped the pieces of the Iran-Contra relic to Quepos. From San Jose the fuselage was shipped via ocean ferry (from Caldera to Quepos) because it was 10 inches too wide for the antiquated Chiquita Banana railroad bridges! After hauling all seven aircraft sections of the Manuel Antonio hill, the C-123 finally found its current cliff-side resting place. The room was large and clean, and equipped with its own local wildlife - I spotted at least two very small lizards scampering along the walls. They proved to be quite camera-shy, skittering away if I got too close. Friday and Sunday were supposed to be free days with nothing planned, but I'm not really a "lie on the beach and soak up the sun" sort of person, so I took a look through the excursions that the hotel could arrange, and settled on joining a guided tour of Manuel Antonio National Park (highly recommended in the guides I'd seen) on Friday, and some time on a jet-ski tour on Sunday. Booking these was marginally more difficult than it needed to be. You book them via the hotel, so I phoned up reception and was told that they could book them, but needed a deposit. In cash. Delivered then and there. By this point the afternoon thunderstorms had arrived, so I made the rather lengthy trek to the nearest ATM to withdraw some cash, and then the even lengthier trek to reception, ~ 10 minutes from my room. Why they couldn't just bill it to my account I don't know.